The Isalo National Park is part of the Ranohira municipality in the Ihorombe region. 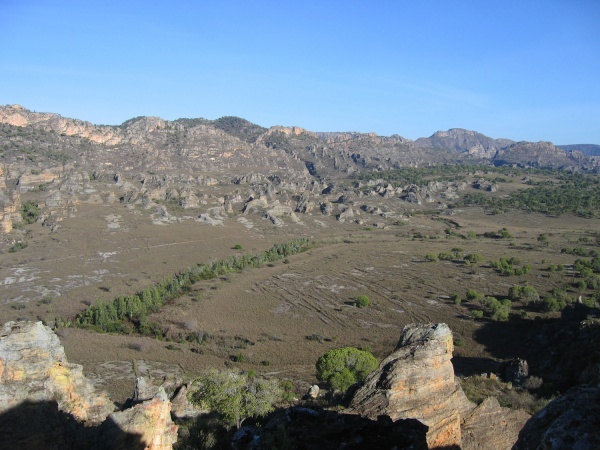 The park is located 279 kilometres south of Fianarantsoa and 80 kilometres south of Ihosy. The park is the most visited protected area in Madagascar and a popular highlight when discovering the Great South. 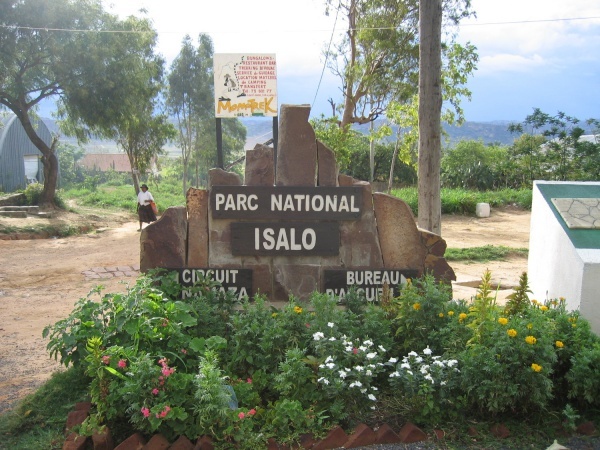 Isalo National Park was founded in 1962 and is administrated by Madagascar National Parks since 1997. The park is situated along the RN7, a tarred road connecting the capital of Antananarivo with Tulear. The road is in very good condition and accessible all year round. The route from Antananarivo to Ranohira, also known as the "door to Isalo", takes about 15 hours by car (701km). From Tulear to Ranohira is a 4-hour drive (250km). It is also possible to travel by taxi-brousse, which leave daily from Fasan’ny Karana station in Antananarivo, Antsimo station in Fianarantsoa and Sanfily station in Tulear. The park spreads over an area of 81,540 hectares, with an average length of 59 kilometres and an average width of 22 kilometres. The perimeter of the park is 164 kilometres. The altitude varies between 514 metres and 1,268 metres and some of the canyons are up to 200 metres deep. 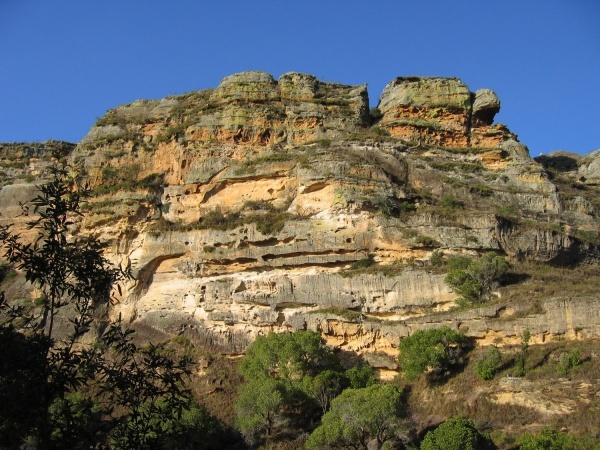 The Isalo massif is a continental sandstone plateau, dating back to the Jurassic times. The park features various sandy valleys and narrow canyons. Strongly attacked by erosion, the rocks vary in shape and composition. The soil in the park is rich in iron and aluminium. In the eastern part of the park, the following rivers flow from north to south: Marandra, Tsiombivoly, Andriamanero, Andranonkova and Namaza Ianakandrarezo, all small tributary rivers of the Menamaty, a tributary river of Mangoky. In the western part, the following rivers stream from north to south: Sambay, Amboloando, Ankademoky, Sakamalio, Hoanga, Vohibasia, Andranomena and Sambalahitsara Analakira, all of which are small tributary rivers of Malio, another tributary of the river Mangoky. The climate is tropical dry, with an annual rainfall of 800-1000mm in the months of December to March and an average temperature of 17°C in June and 25°C in February. Since centuries the Bara people dominate the Isalo region. 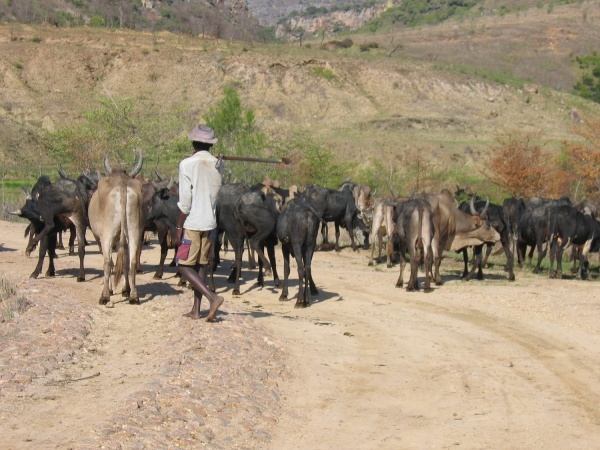 Their main activities are livestock, especially zebu, and agriculture. 39 species of reptiles can be found in the park. The snake Typhlops arenarius and the skink Mabuya vato are endemic. Amongst the amphibians living in the park are 2 endemic frog species: Mantidactylus corvus and the Malagasy rainbow frog (Scaphiophryne gottlebei). 14 species of lemurs can be found in the park. The following lemurs are nocturnal (active at night): Coquerel's giant mouse lemur (Mirza coquereli), Red-tailed sportive lemur (Lepilemur ruficaudatus), Western fat-tailed dwarf lemur (Cheirogaleus medius) and the Grey mouse lemur (Microcebus murinus). The Verreaux's sifaka ("Propithecus verreauxi"), Ring-tailed lemur ("Lemur catta") and Brown lemur ("Eulemur fulvus") are diurnal (day active). Carnivores: Small Indian civet (Viverricula indica), Fossa (Cryptoprocta ferox) and the Malagasy civet ("Fossa fossana"). Insectivores: Lesser hedgehog tenrec ("Echinops telfairi). Mantella expectata Blue-legged Mantella Frog with blue legs, yellow back, black and white dotted chest. Natural swimming pool circuit. Rainy season. Mabouya sp Long-tailed skink, reptile. Six species of this genus are only known in Madagascar, all are endemic. Brown colour, neck with white dots. Natural swimming pool circuit. All year round. Boophis albilabris occidentalis White-lipped bright-eyed frog Frog, endemic to Isalo and Bemaraha. Cascade of the Nymphs circuit. Rainy season. Pseudocossyphus bensoni Benson's rock thrush Songbird, endemic to Madagascar. All circuits. All year round. Brookesia Chameleon Canyon of the rats. Rainy season. Buteo brachypterus Madagascar buzzard Bird of prey, endemic to Madagascar. Can be found throughout the island. Canyon. Dry season. Polyboroides radiatus Madagascar harrier-hawk Bird of prey, endemic to Madagascar. Fairly common. Canyon. Dry season. Upupa epops Hoopoe Colourful bird with an distinctive orange crown of feathers. Terpsiphone mutata Madagascar paradise-flycatcher Bird that can be found on Madagascar and the Comoros. Namaza circuit. Rainy season. 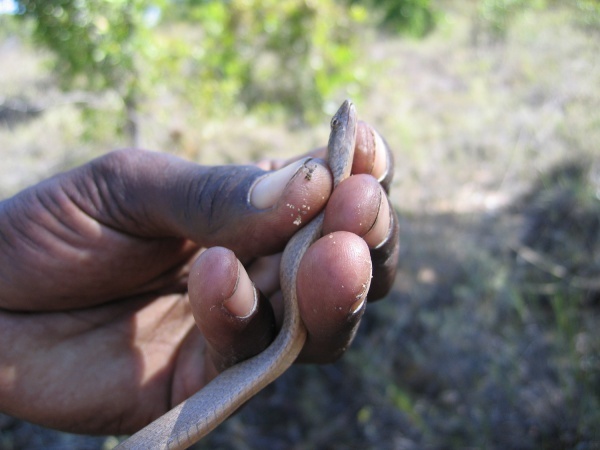 Acrantophis dumerili Dumeril's boa Snake that can be found mostly in the southern and southwestern Madagascar, especially in Andranolava near Mahajanga. Namaza circuit. Rainy season. Ithycyphus perineti Perinet night snake Snake that lives in the rainforest. Namaza circuit. Rainy season. Scorpion Natural swimming pool circuit. All year round. Phromnia rosea Flatid leaf bug Insect. At a distance it can be mistaken for a flower. All circuits in the forest. Rainy season. Bismarckia nobilis - a typical palm of the region, with the particularity to resist fire. Its branches are used by the villagers for plaiting. The Malagasy name for the palm is "Satrana". Apocynaceae Pachypodium rosulatum Elephant's Foot Plant Endemic to Madagascar Natural swimming pool circuit. All year round. Ichnolepsis tuberosa Natural swimming pool circuit. All year round. Asclepiadaceae Menabea venenata Endemic to Madagascar. Natural swimming pool circuit. All year round. Aloaceae Aloes isaloensis Endemic to Madagascar. Natural swimming pool circuit. All year round. Sarcolaenaceae Sarcolaena sp Endemic to Madagascar. All year round. Asteropeiaceae Asteropeia micraster Endemic to Madagascar. Dipterocarpaceae Monotes madagascariensis All year round. Arecaceae Dypsis onilahensis Endemic to Madagascar. Cyathea isaloensis All year round. This huge eroded massif extends over a large grass bed dotted with patches of forest. Isalo offers a fantastic, colourful landscape, shaped by erosion, and incredible panoramas. The south consists of a large, sandy plateau, 800 metres above sea level. The plateau is characterised by savanna, shrubs, grassland and naturally eroded sandstone hills. The east consists of a large plateau with an altitude of 1,000 to 2,000 metres. It is largely covered by sclerophyllous plants and grassland. The plateau is cut by numerous varyingly deep canyons with more or less permanent streams. The east of this plateau is dominated by rocky cliffs, characteristic for Isalo. The west is a vast monocline plateau with an average altitude of 1,000 metres. It is almost entirely covered by sclerophyllous plants and large plains of grassland. In several places the plateau is cut by canyons, similar to those in the east. Like the east plateau, the west plateau also ends by rocky cliffs. The central part between the east and the west is dominated by a valley, a sequence of plains and low-lying plateau, surrounded by sclerophyllous plants and grass meadows. The north consists of a large rock barrier in the eastern part with typical rocky escarpment at its end, varying in altitude between 800 and 1,200 metres. The centre is formed by a vast monocline plateau, about 600 to 700 metres above sea level, which greatly reduces the lowering to the Amboloando river. The eastern part is a low plateau of 600 to 700 metres above sea level, descenting to the Malio river. The area surrounding the park in the west, east and south consists of peneplain with an average altitude of 800 metres. (A peneplain represents the final stage of fluvial erosion in times of extended tectonic stability.) In the west, some forest along the river beds of Malio, Analalava and Analambia remains, forming the park boundary at this side. In the east, there is also a remnant forest along the river bed of the Menamaty, but smaller in size compared to the west. The rest is dominated by a large tree and shrub savanna which occupies a large area with grass land. The park office is located in Ranohira, 3 kilometres east of the park. There you can inform yourself about the various tours, guides and their rates as well as accommodation costs. Please bear in mind that the office does not open before 7am, so it is advised to obtain an entrance permit already a day in advance in order to have a full day in the park. There are 70 guides working in the park. All speak French, as well as some English, Italian and German. All guides are educated in ecology, geology, local culture and technical guidance. A noticeboard informs visitors about the specialty of each guide. More information about the park is available at the Maison de l'Isalo, an interpretation centre located in Zahavola, about 9 kilometres south of Ranohira along the RN7 direction Tulear. The centre holds a permanent exhibition about the geology, fauna, flora and the influence by the local people. The museum is open daily from 6.30am to 6pm and there is no entrance fee. The admission fee for visiting the park for foreign tourists is 65,000 Ariary per day, children pay 25,000 Ariary per day (prices 2015). Guides are obligatory. The fee for a guide depends on the chosen tour (circuit). Porters cost 20,000 Ariary a day. The income derived from entrance fees is used to finance several microprojects in the area, such as building of schools, wells, basic hospital, market place and reforesting. There are several circuits crossing the Isalo National Park. Visitors can choose between easy and medium level circuits. It is possible to combine individual circuits by staying overnight at a campsite in the park. Medium circuit, 3 km by car from Ranohira to Mangily and thereafter 3 km trek (3 hours). This is the most popular circuit in the park offering panoramic views. 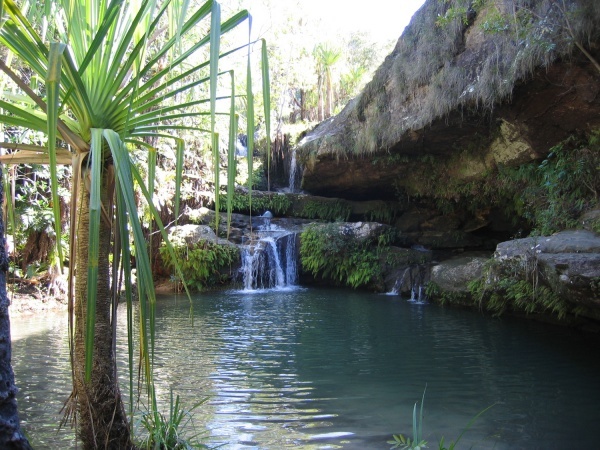 The trek leads you to a palm-fringed pool, constantly fed by a warm waterfall. You walk through diverse ecosystems passing eroded cliffs with strange shapes, the plain of Tapia trees, the big savannas and several tombs of the Bara and Sakalava people. Beside various plants, one can observe the Ring-tailed lemur in the Mangily forest. The nearby Analatapia campsite has a toilet, shower and barbecue facilities. Easy circuit, 4km by car, thereafter 2,8km trek (3.5 hours). Easy trek to the campsite, however, the ascent from the river up the waterfall or to the Black Swimming Pool can be more strenuous. This tour takes you through the canyon to the Black or Blue Swimming Pool. You will climb along waterfalls inhabited by many rare birds, butterflies and lizards. From the top, one has a panoramic view over the green canyon. Throughout this trek you will have the possibility to spot lemurs. The highlight is a bath in the dark waters of the Cascade of the Nymphs. Medium circuit, first 17km by car, thereafter 1.7km trek (2.5 hours). This circuit combines the wild nature and cultural discoveries. 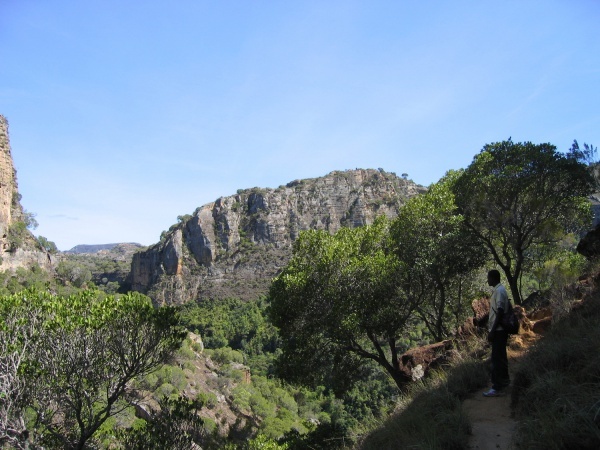 The trek offers panoramic views onto rice fields, incised rocks, gorges, the Canyon of the Makis and Rats as well as the huge Ihorombe plateau. The hike will take you to a former royal village, where you will see the surrounding palace wall, the royal bath, the royal tombs as well as traditional Bara tombs. While hiking up the huge gorges you can discover the unique flora of the forest and observe numerous colonies of lemurs, birds, butterflies and lizards. At the end of the trek you can go for a swim in the canyon. Medium circuit, 3km by car and thereafter 4km on foot (2.5 hours). Discover the natural geological forms, for which Isalo is famous: "Reine de l’Isalo" - The Queen of Isalo, "Botte" - The Boot, "Loup" - The Wolf, "Tsingy de l’Isalo" - sharp limestone karst pinnacles. Medium circuit, 42km by car (4 hours), thereafter a 2km trek. The Malaso circuit draws its name from the zebu thieves which use the natural labyrinth of the Isalo for their activities. 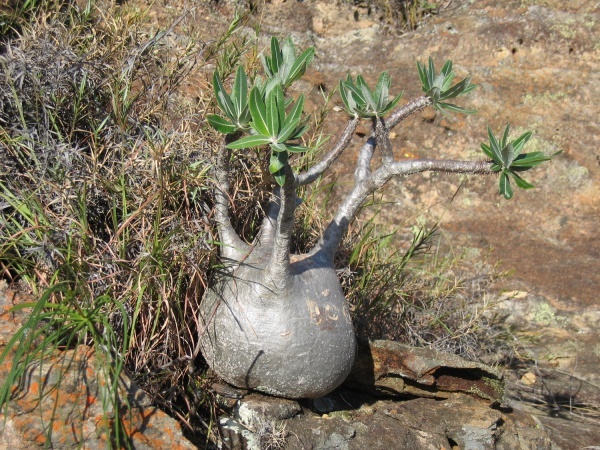 The car will take you to a site where Pachypodium, Aloe and Kalanchoe grow. 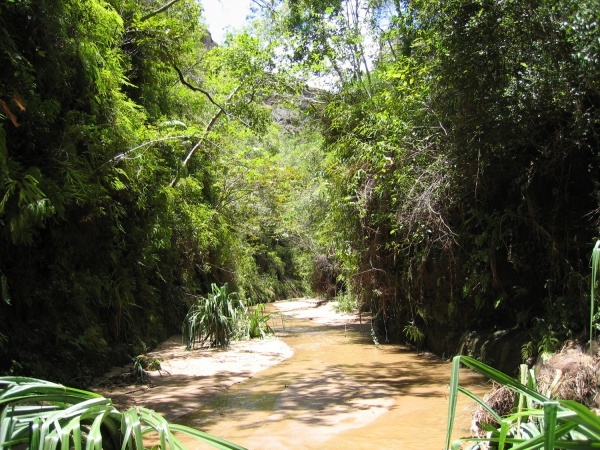 Thereafter you will trek for one hour with the opportunity to discover the vegetation of the Isalo National Park. You will see the southern wall, the Tsihitafototra canyon, lemurs, the Isalo Ranch and The Boot. 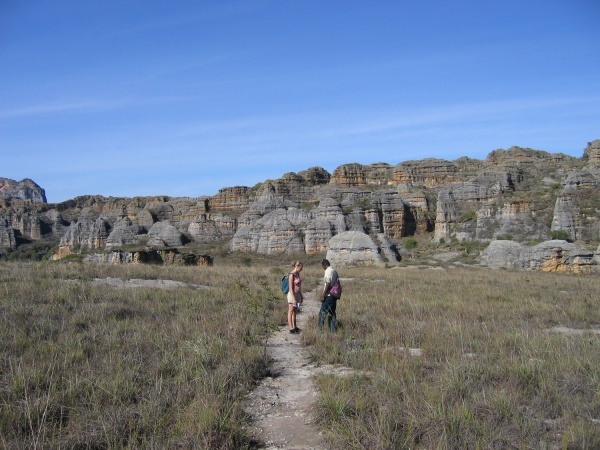 Thereafter the trek will continue through a geological site, where you will see the Tsingy of Isalo in the savanna, the Ampasimaiky cliffs and The Wolf rock formation. From the peak at a height of 975m above sea level you will have an unlimited view over the entire park, the best place to admire the vast extent of Isalo. 30km further you will be near Lac Andranovorinkaolo, a lake paradise for wild ducks. Thereafter, cross the Satrana savanna to get to the Window of Isalo - a natural rock formation in shape of a window through which the sunset can be seen. Medium circuit, 29km by car (5 hours) and thereafter 5km on foot. This circuit will take you to a riparian forest where lemurs live. The trek and ends at the foot of an amazing waterfall. This trek along rain-loving vegetation gives you the opportunity to see orchids, birds and lemurs. The hike ends at a wonderful waterfall. Medium circuit, 20km by car (4 hours) and thereafter 1km on foot. You will cross the Tapia forest, an riparian forest with palms and lemurs, to reach the Green Lake (Lac Verte) which is a sacred location. Hard circuit, 4 days on average. 120km on foot or 40km by car and 80km on foot. This tour compiles all sites, fauna and flora of the park: Archaeological sites (Grotte des Portugais), unforgettable panoramas, the dry forest and the rain forest, birds and lemurs (day as well as night active) and the natural swimming pool. Grotte d’Ihosy - an underground cave located about 9 kilometres from Ranohira, easy to reach by foot or car. Bilo - a ritual of exorcism to cure the patient by removing the spirit that inhabits its host. During a 7-day long ceremony an ox is slaughtered. The involved persons are the patient, the healer, the Mahavatsy and the Tiam-bilo. Turning of the dead - a 7-day funeral ritual, at which relatives and villagers have the opportunity to speak to the deceased. Hazomanga - a sacrificial ceremony to pray to Zanahary for the living and the dead. Hazomanga is the name of the altar where the sacrifice takes place as well as of the person who officiates the sacrifice. Prayer - to call Zanahary and the ancestors to explain the reasons for the opportunity and demand. Joro - the sacrifice, usually a cow, or in case of pregnancy rice and honey. Tsipirano - the blessing, spraying water or water mixed with blood at the Joro. The omnipresence of zebu in traditional ceremonies is a natural element in the culture of the Bara people. In the past, before getting married, a young Bara had to steal a zebu to prove his strength and bravery. The Malaso Circuit was named after the famous cattle thieves, who until today still use the natural labyrinths of the Isalo for their activities. Malaso literally means "cattle thief". 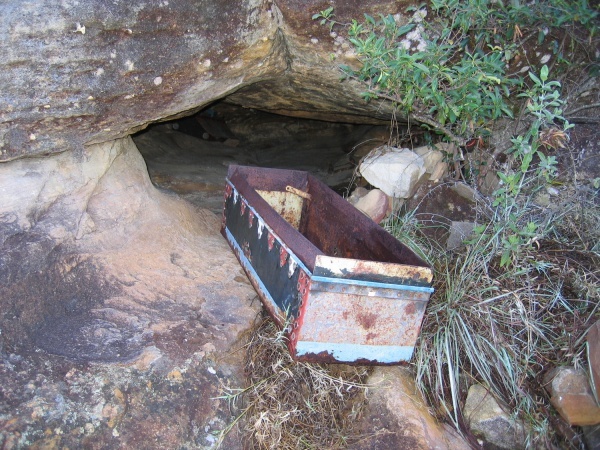 The entire Isalo National Park is a sacred place. 68 tent sites, tents for 2 people, 5,000 Ariary per person/night. 34 tent sites, tents for 2 people, 5,000 Ariary per person/night. In Ranohira and along the RN7 direction south are plenty of accommodation alternatives, ranging from basic rooms to luxurious bungalows. There is also the possibility of a homestay by renting a room from a local villager. This page was last modified on 23 February 2017, at 08:00.